Already, brand recall is high—and the product is not even out yet. The Indian Cricket League, or ICL, has begun creating a major buzz, from fans to commentators to politicians. Last month, the board blacklisted the 44 cricketers who had joined the rebel league, and removed former India captain Kapil Dev from the chairmanship of its cricket academy for taking up an assignment on the ICL executive board. The board’s reaction made front-page headlines, grabbed daylong television time, and drew sharp rebuke from players in other cricket-playing nations such as New Zealand, drawing even more coverage. In New Delhi, railway minister Lalu Prasad declared all stadiums owned by his department would be at the disposal of Chandra’s Essel Group which, along with Infrastructure Leasing & Financial Services (ILF&S), will invest Rs100 crore in the league. 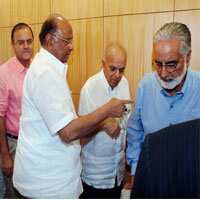 Congress leader Digvijay Singh, in a letter to BCCI president and Union minister Sharad Pawar, added his bit, rubbishing the board’s claim that ICL was no more than a commercial venture. “Hasn’t BCCI also become a commercial venture that is earning millions by allowing multinationals to use their logos on players’ outfits? In fact, it has earned more millions than trophies," news agency PTI quoted him as saying in the letter. And, in Kolkata, the irrepressible communist sports minister Subhash Chakraborty, a buddy of former BCCI president Jagmohan Dalmiya (whose regime was defeated by the current one), went a step further: He offered the historic Eden Gardens stadium. “There’s huge media hype, they don’t have to advertise it, the media is doing it for them… this PR will give them huge mileage," said media buying company MindShare’s general manager M.K. Machaiah. In the process, ICL is poised to change the face of the business of cricket. That is, if it can succeed in going beyond mere newsprint space, and catch the imagination of a country that turns away from domestic matches, even if the iconic Sachin Tendulkar is on the field. Gaurav Seth, vice-president, marketing, Zee Entertainment Enterprises Ltd, an Essel Group company, says there were reasons for optimism. “The initial response wasn’t anticipated," he said. “We are optimistic." But, at the same time, he says the biggest challenge facing the league still boils down to consumer satisfaction. “The hype is all very good but, ultimately, for setting up any quality sporting property anywhere in the world, there has to be consumer satisfaction." Seth, who has been entrusted with the marketing aspects of ICL, isn’t ready to unveil Zee’s plans to ensure this, but says the aim is to create a “world-class cricket product that consumers will follow". The packaging will involve a mixture of entertainment and cricket—there will be Bollywood glamour on the field, to attract eyeballs to the league, to be broadcast on sports channel Zee Sports, currently without a single cricket property in its kitty. The league’s marketing team is exploring associated business avenues such as ground and on-air sponsorship as well as syndication of columns written by its large pool of players. Also on the cards is merchandising of league-related apparel. How far this will succeed in India—where brand knockoffs are sold openly on the streets—remains a question. But the organizers plan to name the six teams after six cities: It’s a scheme aimed at fanning regional passion and creating regional fan banks. And maybe, sometime in the future, it will lead to the sale of apparel that carries team names. Media planners are cautious but, at the same time, see an opportunity for smaller sponsors. For MPG India chief executive Anita Nayyar, it’s a “wait-and-watch" period now, but she concedes one can’t ignore ICL. “There will always be some spectators, irrespective of the players," she says. But if ICL wanted the requisite viewership, there has to be an endeavour to rope in bigger names, she says. MindShare hasn’t advised its clients to advertise during domestic tournaments such as the Ranji Trophy, which is televised on sports channel Neo Sports, but sees ICL as a viable investment avenue. Machaiah says he has been approached by Zee Sports in connection with the league, and could end up buying space in the first year, when the buzz is the most and there’s “initial sampling". Next year, he says, ad rates will be evaluated after taking eyeballs into account. Shailendra Singh, joint managing director of entertainment at media and communications company Percept Holdings, which fetched lucrative apparel and sponsorship deals for BCCI, describes the Indian cricket fan as a “strange species": They don’t love cricket, but they love the Indian team. Yet, ICL will find takers, “fence-sitters who cannot afford BCCI’s offerings", Singh says. Adds Farokh Balsara, partner and national sector leader of media and entertainment practice at Ernst & Young Pvt. Ltd: “ICL will pull in a newer type of advertiser, people who are not into cricket even if they want to (be)…say, agarbatti (incense stick) companies." There is another consensus: While BCCI is far from being threatened by ICL, the cricket it conducts within the country stands to benefit from the league. Observers also say ad rates for international games won’t come down on account of Zee’s lower rates. Machaiah says ICL has spurred the board to now talk of its own professional leagues, which will lead to better remuneration for players. Balsara says ICL, with its entertaining Twenty20 format, 7-10pm primetime slot and international stars such as Brian Lara, has the potential to become like an English county league. More interestingly, says Percept’s Singh, ICL could even push up current ad rates as sponsors will see “the real deal"—matches featuring the Indian team. It will be like rents going up at office complex Phoenix Towers in Mumbai after Saraswati Towers, another complex with lesser facilities, came up in the vicinity, he says. “ICL’s investments are going to make BCCI’s products more pricey." Zee’s Seth is unperturbed. He says it’s an established fact, worldwide, that the more the number of people involved in a sport, the more that sport will develop. “ICL will benefit Indian cricket," he says. Seth is right on that score. In the last week of August, BCCI acquired a new partner—Singapore-based sports marketing company World Sports Group (WSG)—and made a bundle from the alliance: It sold WSG the ground sponsorship and title rights for 55 matches till March 2010 for Rs173.2 crore, or about Rs3.15 crore per match. The last time round, these rights had been sold at between Rs1 crore and Rs1.5 crore per match.